For two years, I worked toward a lofty life dream: to outfit a van and drive from California to Patagonia. By last winter, plans were finally coming to fruition. I quit my job, my boyfriend and I set a date to move out of our house, and our van was, well, a work in progress. But one month before we planned to leave, he called it quits on the trip—and ended our three-year relationship. With no job, no place to live, and a travel dream that seemed impossible to pursue solo, I felt pretty lost to say the least. But I still had a van, a serious case of wanderlust, and a dog. So I rolled with the changes and started the adventure anyway, with my 30-pound heeler mix as co-pilot. Rodi “Rodrigo” Herzog came into my life about a year prior to it turning upside down. He’s the kind of dog that wins over hearts with his rugged good looks and shameless penchant for cuddling, then turns a few heads by charging down trails and practically levitating over boulders. If Rodi could survive a puppyhood wandering the plains of rural Nevada on his own, he could survive living in a van with me. But I was a bit less sure about my van. Less than a quarter of the way outfitted at the time I decided to take the trip solo, my Sprinter came with more than a few faults: shattered windshield, balding tires, two out of four functioning doors, and more dents than a recycled beer can. For three weeks I worked at an unrelenting pace to get that sucker running and built out with the poorly-leveled plywood that I now call home. Van mostly functional, dog always primed for adventure, Rodi and I set off for a road trip of undetermined length, unspecified time, and half-baked purpose. Instead of heading south to Latin America, I decided to start east and figure out the journey one step at a time. Ten months, 24 states, and two countries later, we’re still on the move and still happily unsure of when and where we’ll land next. Nonetheless, life on the road with Rodi has taught me a thing or two about, well, life. 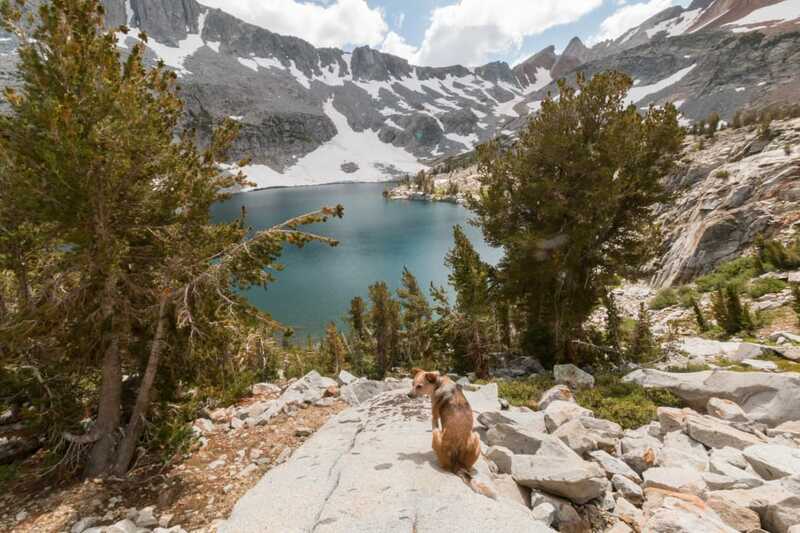 Here are some of the quirks and perks of embarking on this type of travel with a dog. Embrace the fact that your dog will likely be more popular than you. 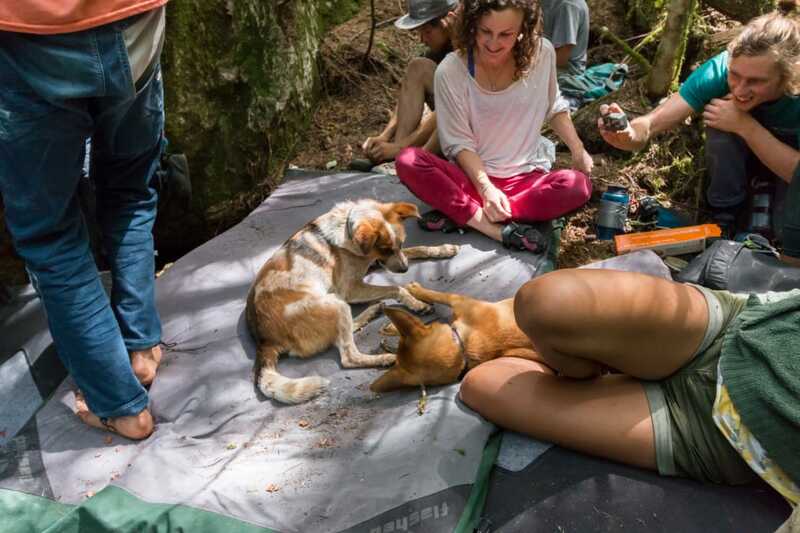 Unless you walk around the campground passing out free IPAs and down jackets, most people will find your dog to be far more interesting than you—and they will want to quiz you about him, pet him, and hang out with him. Countless times now I’ve waltzed through the routine: guess what breed my mutt is, ask me how old he is, tell me that he looks like a coyote. After enough of these casual encounters turning into friendships and climbing partnerships, I readily accept that Rodi is my better half, and that if people want to strike up conversation with me just to sneak a few cuddles with a cute pup, then so be it. One August evening, I rolled into Oregon’s Smith Rock State Park campground after six hours of driving. I was tired, hungry, and a little unsure if this pit stop on my way to Yosemite would be worth it. In my weary and cranky state, I wanted nothing more than to curl up in bed and scarf down a Clif bar for dinner. Van door open, I was left with nothing but the sound of Rodi’s tags as he trotted away, likely lured by the smell of roasting sausages. Wandering out by headlamp to retrieve my begging dog, I was greeted by Rodi’s new friends, a group of climbers quick to offer me a seat at the picnic table, complete with a beer and brat. The next afternoon, I found myself with no plans and no climbing partners, so I embarked on my usual routine of walking around the crag with Rodi. At the very least, I get to see the climbs and Rodi gets an always-appreciated walk. Tail wagging, Rodi charged ahead to the open arms of a guy sitting on a bench watching his two friends climb. A few minutes later I was tying my figure-eight and chalking up to climb with them. Without Rodi, I probably would have walked right by without a word, feeling too shy to ask if I could join their party of three. A couple months later, I’ve now shared summits in three different states with one of the climbers I met that day—all thanks to my dog. Don’t swear off all national parks. 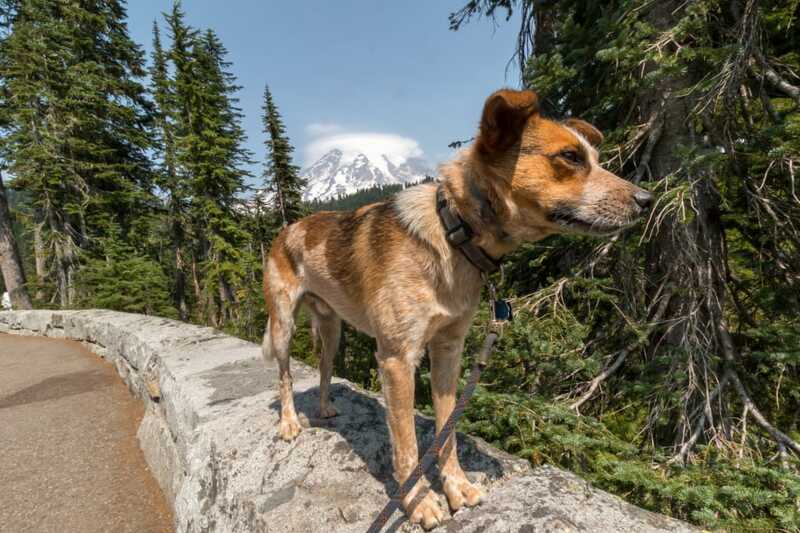 National parks in the U.S. are generally not the best places to go gallivanting around with a dog. In my experience, it all comes down to taking the time to research where a dog can and can’t go within a park’s boundaries and weighing that against what I hope to do while I’m there. Take Yosemite, for example. Since I spend most of my time traveling to rock climb, it’s no surprise that this park runs high on my list. My first time going to Yosemite Valley with Rodi, I had little faith that he could endure the place for long. Thankfully, I found that the paved walkways in the valley offer plenty of opportunity for scenic dog walks, albeit usually in the dark after I finish climbing for the day. And driving outside of the park to camp every night gives Rodi enough space to let out excess energy, which is well worth the few extra dollars in gas. Meanwhile, the much less-crowded Badlands National Park in South Dakota boasted one of the best camping deals for budget-conscious and dog-owning travelers: a wide open field with free camping where Rodi was welcome to enjoy the views too. If all else fails, the surrounding towns near national parks usually offer at least one option for doggy daycare or overnight lodging. Places like these have saved me a few headaches, allowing me to explore national parks for a day or two without worrying about Rodi. Know what your dog is capable of—and what’s too much. This is undoubtedly the biggest lesson I’ve learned overall as a dog owner, and one that Rodi and I regularly consolidate through experiences on the road. I’ve been able to travel with very few dog-related challenges not because Rodi is the perfect dog, but because I know his needs, fears, and tendencies. Knowing what Rodi can handle has made our travels run smoothly, and testing what Rodi can handle has made for good stories (and plenty of lessons learned). The time when a cop came knocking on the van door to tell us to move from our not-so-stealth and not-so-legal camping spot in small-town Montana, it was clear that Rodi’s Mom!-Alert!-Danger! howl was imminent. One stern stare and a whispered command to stay quiet was (surprisingly) all he needed to curl back up in his bed and let me do the talking. Afternoons spent romping around climbing crags in Utah? No problem. Tagging along for a few drinks at a bar in Tennessee? He’d never complain about that. Packrafting down Class II rapids in Colorado? Achievable and hilarious, but not his favorite. Attempting a Tyrolean traverse over a 200-foot-wide river with Rodi in a backpack? Well, that was a one-time thing. Accept that sometimes it takes a village. Taking care of a dog while constantly managing every other aspect of my nomadic life can get a little taxing without a travel partner. But, like most single dog moms and dads out there, I make it happen. The important thing I’ve realized is that most other travelers have a Vitamin D(og) deficiency, and since Rodi is friendly and generally low-maintenance, I’m doing them a favor by letting him fill that void. 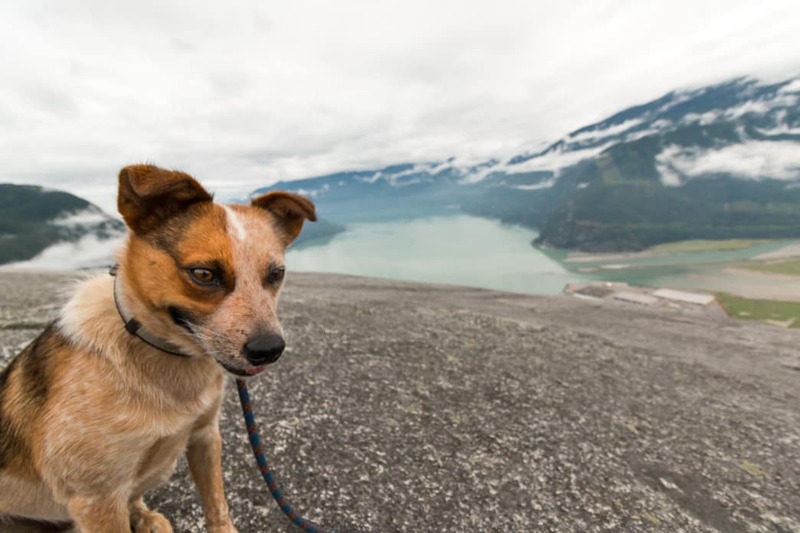 In Squamish, British Columbia, for example, my sights were set on multi-pitch climbs that required being off the ground for up to 10 hours at a time—too long to leave Rodi alone in the van. In these times of need, I turned to my community of fellow van-, truck-, and tent-dwelling climbers for a little help. It usually wouldn’t take more than five minutes of walking around the campground or the climbing area parking lots to find a group of new friends willing to hang out with Rodi for the day. They got to enjoy cuddles with my pup in between pitches at the crag; I had peace of mind knowing that Rodi wasn’t roasting away in our metal box of a home under the afternoon sun. Don’t leave home without ‘em. In the last 48 hours before leaving home, I wasn’t fantasizing about dream destinations, fretting over my lack of a steady job, or cursing how much cash I just dropped on new tires. Rather, my mind spun in circles wondering if it were smart, safe, or even possible to bring Rodi on the trip. I struggled to imagine how he would fit into my new, very uncertain lifestyle. Now, almost a year and more than 18,000 miles later, Rodi has been there with me through it all, never once back-seat driving, complaining about a camping spot, or getting grumpy after a few too many days without a shower. To me, he’s the ideal travel partner. 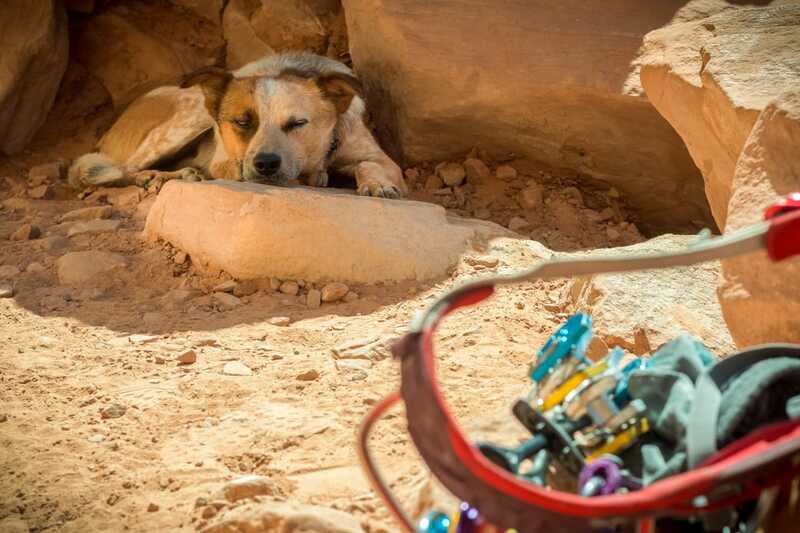 On a deeper level, I credit Rodi with giving me the extra edge of confidence and much-needed companionship that has made it possible for me to travel “solo” for months on end. So here’s to Rodi, the pup whose playful spirit and unwavering affection helped push me out the door and into a life of adventure at a time when I had nothing to lose.